I have never really considered myself a technical climber. Maybe it's that I've always seen my goals and adventures in the mountains fitting more into the "mountaineering" or "scrambling" categories, but I've never really been able to relate to folks who frequent the local "crag". It's been a sort of joke that I've always replied to my regular partners' nutty climbing ideas with "Yeah...when I learn how to climb! ", but I somehow end up pulling through. I had not intended on starting this trip report like this, but it is something I spent plenty of time thinking about on this trip so I decided to include it. It will probably be longer than the rest of the report anyway but I think it gives a bit of perspective. Sometimes I find it odd when I look at the direction my climbing experiences have taken. I began in the same way that many others seem to these days, the gentle slopes of the Colorado 14ers. 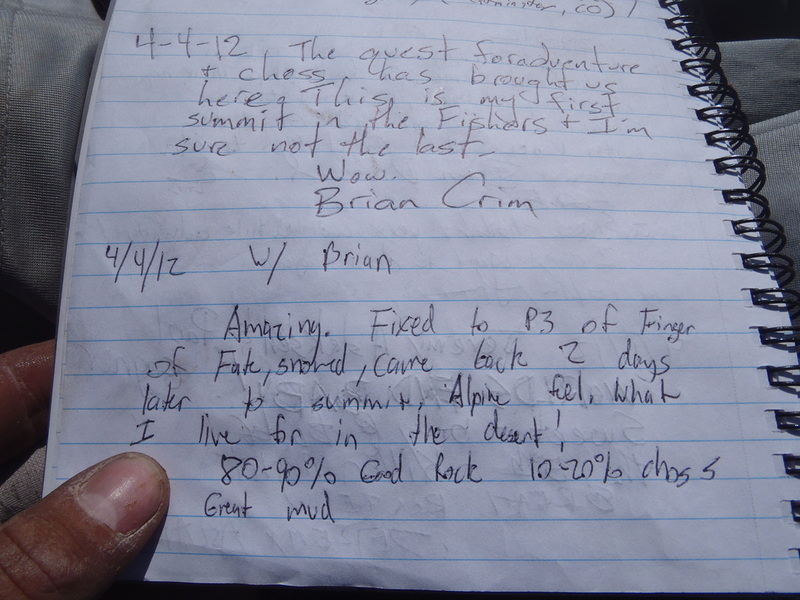 At the time I saw it as "climbing", and the simplicity of the hike was the beauty of the average 14er. A nice trudge to the top of a steep hill provided exercise, wonderful scenery and the broad/comfortable summits seemed to be in a world of their own compared to the humdrum environment I spent my everyday life. My first "scramble" was Longs Peak, and I crawled back to the car with the thirst for something different. I found that the addition of my hands, steeper rock and air beneath my feet created a whole new level of enjoyment and I quickly made plans for other similar "climbs". Kelso Ridge came next and the experience put the fear of God into me. Off-route on loose terrain forced me to realize the severity of the consequences involved in the mountains, even on something deemed "easy". When I got back home from Kelso, I swore off anything else that would be like it. "I will never climb the Bells or Capitol!" came rumbling from my mouth to my wife (still a girlfriend then) and I truly had no intention of doing anything that made me uncomfortable. An important (at least to me) memory occurred on the slopes of Longs. Out for a nice hike up to treeline, my friends and I ran into a party of three carrying ropes and axes. After asking what route they did they replied simply, "Kiener's". It blew my mind to think of these brave climbers boldly traipsing along 5th class terrain on the edge of the diamond. At the time it was easier to picture myself walking on the moon that it was to see myself in their shoes. My scrambling career downshifted but I did continue to pursue what I felt to be easy routes. I truly was blind to this as it was developing, but naturally as time progressed the difficulty of routes slowly ebbed upward. The decision to learn to use ropes came abruptly. 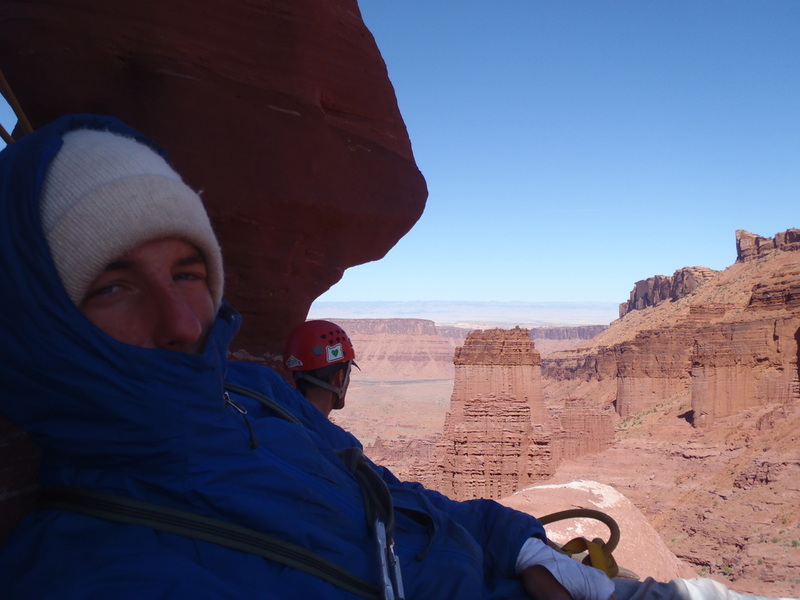 I had been working at the base of Longs and my friends and I had a weekly scrambling club. Every Monday we would seek out something in the Park to saunter up as we slowly cranked up the difficulty. My first scare came on the obscure Little Matterhorn as the exposed moves out to the true summit pushed the limits of what I was comfortable with. The following week we made for Solo Flight on Lone Eagle. As I stood staring down the exposed 4th class downclimb just before the summit, I found the edge of my limits. I waited and watched as my friends summited and came back shaken. I was stuck with a thought that I couldn't seem to get out of my head...If I had a rope and had known how to use it, I also would have summited while adding a margin of safety to soloing. 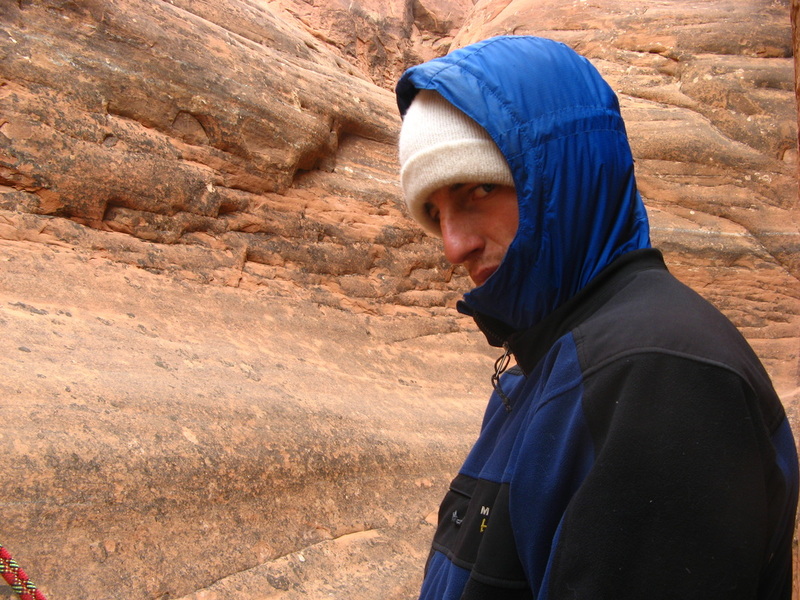 I read every scrap of literature on roped scrambling and climbing techniques and bought a rope and a few pieces of pro. 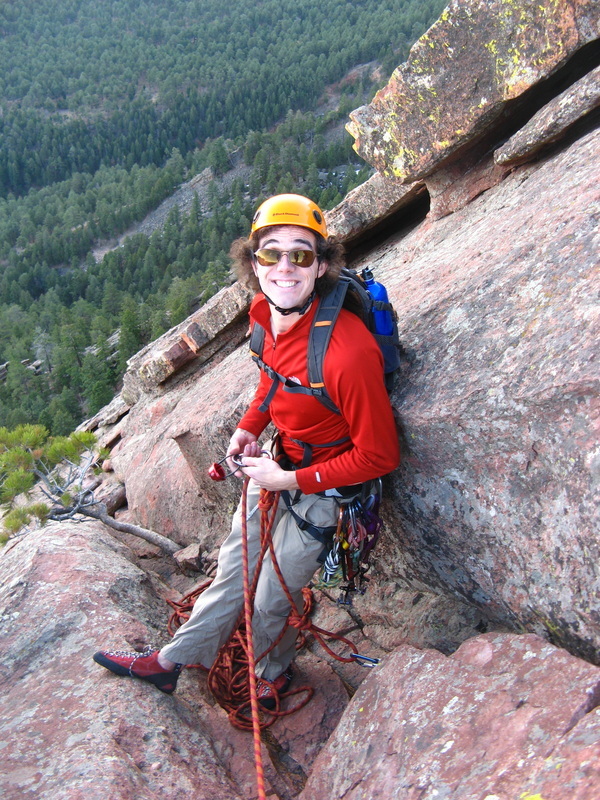 Top-roping soon gave way to "easy" routes in the Flatirons. 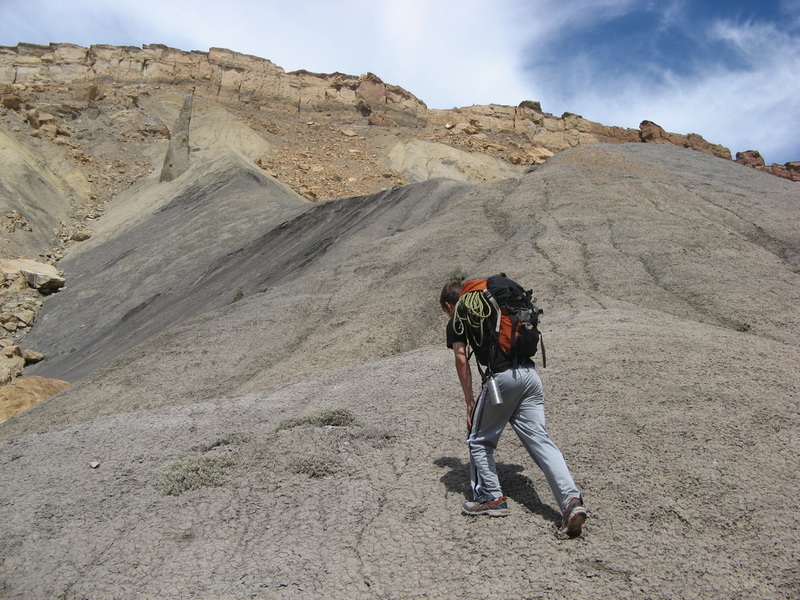 The long, low-angled slabs were where I learned how to climb roped and the learning curve proved fierce. I had managed to wrangle my buddy Shaun into committing to this insanity and as we scrabbled our way up the major Flatirons, we gradually learned. At first our placements would fall out due to our poor skills and our anchors were shoddy at best, but thankfully luck was with us and we slowly got better. 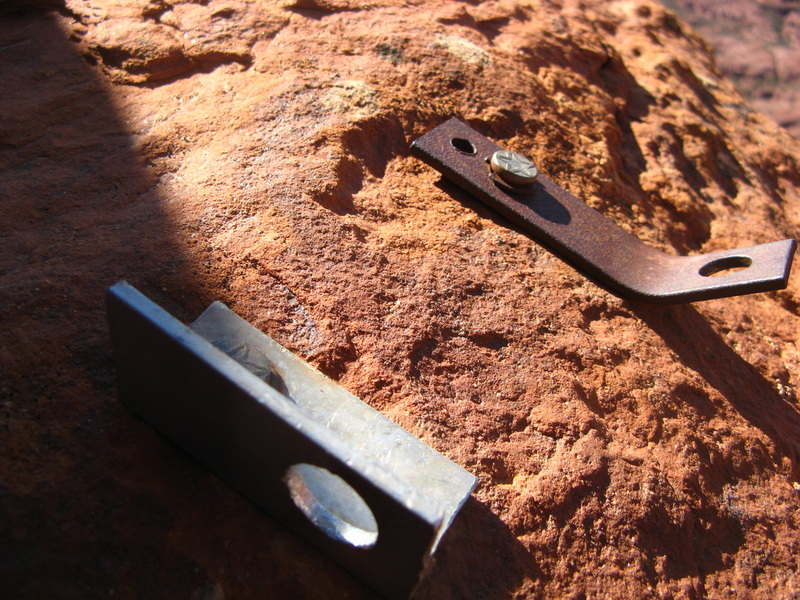 Meeting some real climbers helped and after several years I found myself very versed in the multi-pitch Flatiron slabs. 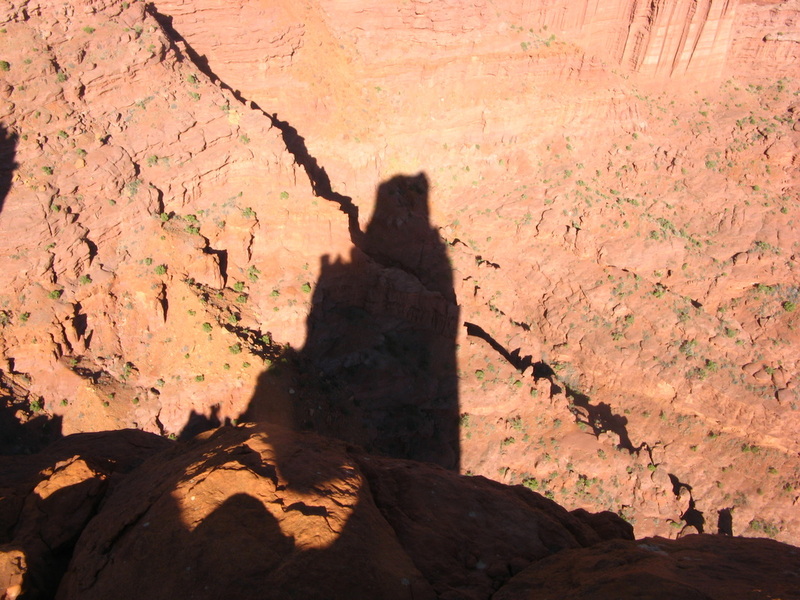 My desire to attain increasing smaller and more elusive summits continued to grow, and although I was spending most of my time on low 5th class rock, I rose to the occasion for special climbs like Independence Monument, Ship Rock, West Pawnee Butte, Spearhead and a variety of desert towers. I found that my drive to climb was based more on the particular summit or mountain than on the quality of climbing or the route. For example, when Noah and I climbed West Pawnee Butte last year, it was the first time that a human had set foot on the top for close to 40 years. The horrible "rock" is certainly what was keeping the armada at bay but I felt a tolerance for shaky climbing and a touch of bravery seemed a small price to pay. Plus, it only helped contribute to the feeling of adventure. Things that are seldom climbed hold a special place in me heart and I feel driven me to them like a moth to the light of a full moon. Noah shares my sentiment on this and has naturally become one of my favorite climbing partners. The spooky downclimb off of Little Matterhorn in RMNP. This prompted me to learn "the ropes". My buddy Shaun high on the First Flatiron while heading up the East Face Direct (5.6R). This was one of our first trad climbs and looking back we were only pretending to know what we were doing. Note the "rack" of 2 cams. Anybody who has quested for the ultimate summit eventually turns up in the desert. 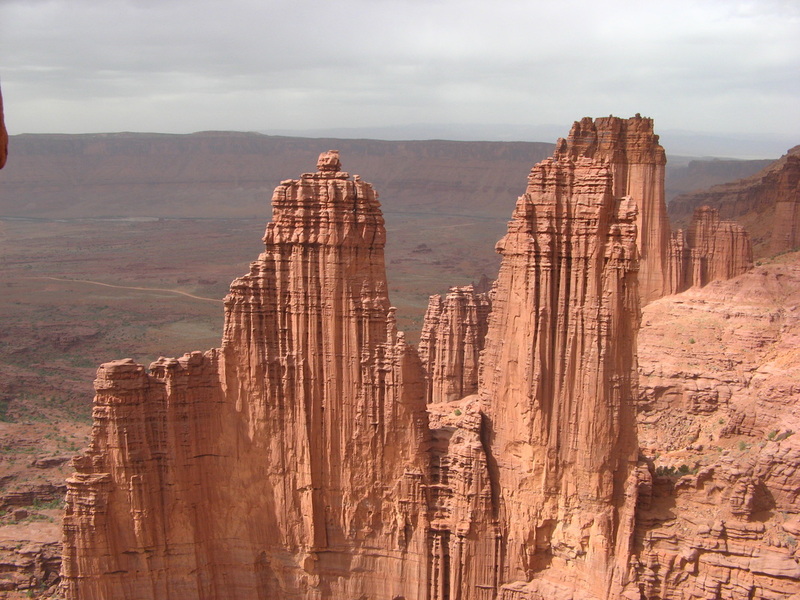 The granite spires of the world often pale in comparison to the gnarled, twisted and monstrous forms taken on by sandstone. While stronger rock merely laughs at the weather's seemingly continual assault, sandstone slowly succumbs to become nature's art. As the weak rock slowly disappears, we get left with steep, smooth, twisted and impossibly odd looking formations that rear up to challenge those wanting to climb them. 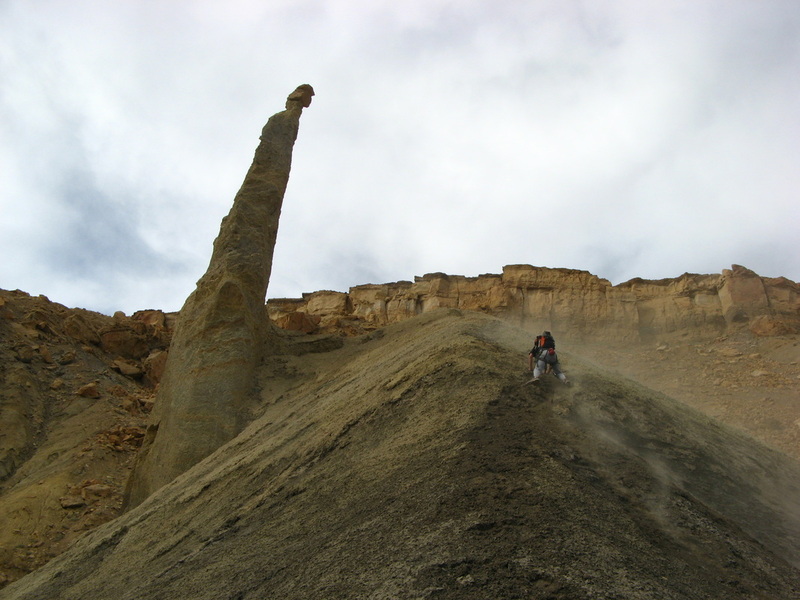 It is very common for a peak-bagger to throw up their arms in frustration simply standing at the base of a desert tower. Also, the nature of the weak stone can give climbers that are only experienced in granite fits. Even textbook cam and nut placements can become something to be feared, and the soft holds can also not always be trusted. Sand can act like ball bearings lining the bottom of your climbing shoes and fill your eyes at the most inopportune moments. Even small towers can take all day and the bag of tricks you must bring often includes everything and the kitchen sink. A first desert tower will be something that becomes etched into a climber's memory and will change the prospective of what is possible. 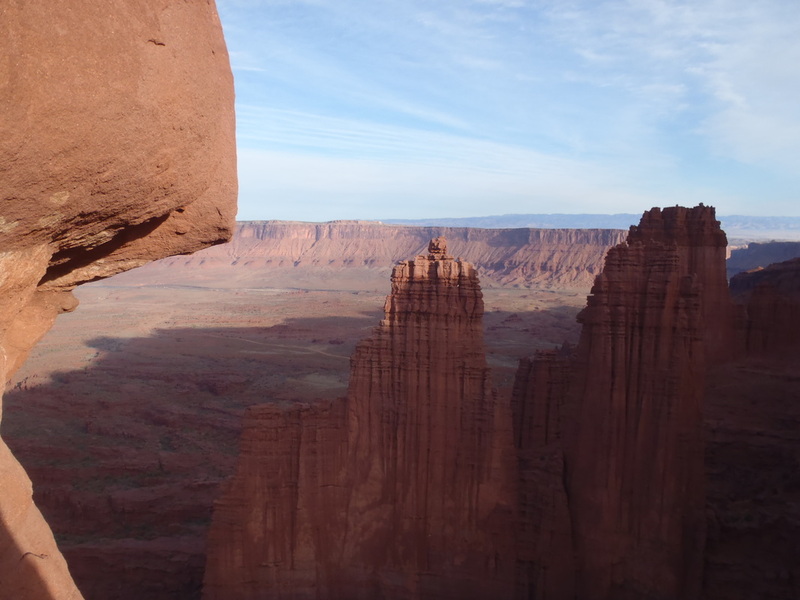 The desire to climb more soon leads one to discover a terrifying list of professional-grade climbing ratings blocking the way to many popular spires. 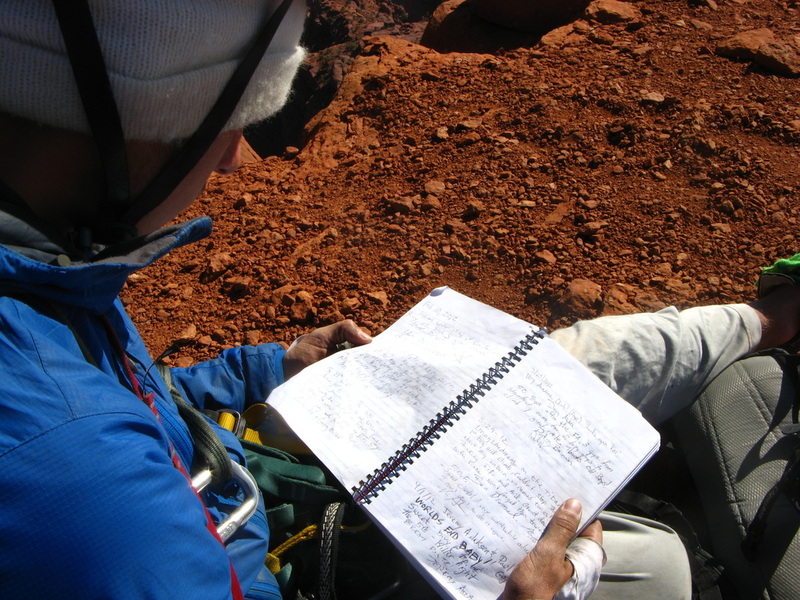 To reach these lofty summits, you must either be an elite climber or learn some tricks. Not being a high caliber climber, I was soon diverted into aid climbing. Where most climbers hate the slow and technical process, I enjoyed the time spent hanging in spots I would otherwise be unable to reach. The first leads were awkward and time consuming but as I spent more time in my aiders it slowly got faster. As I grew more confident, the scope of routes that were possible slowly widened. 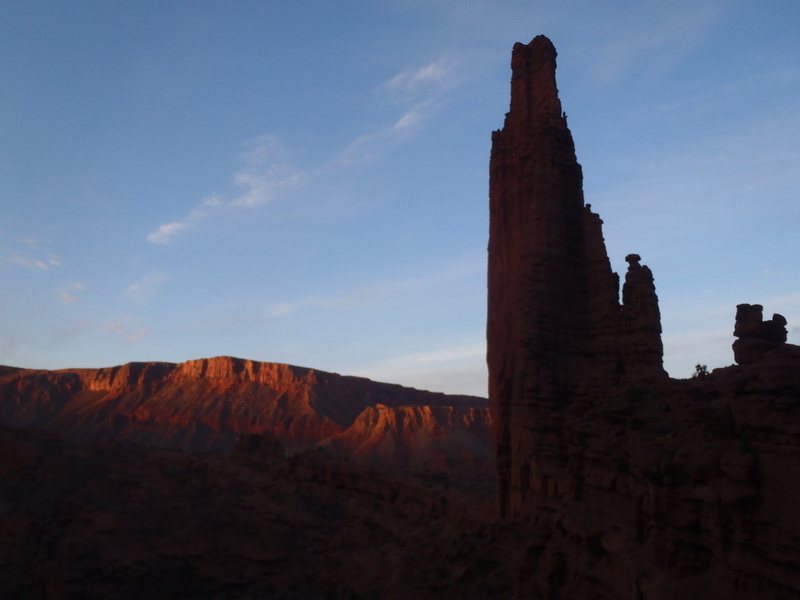 It was only a matter of time before my mind wandered to some of the most unique and feared summits in the desert, the Fisher Towers. 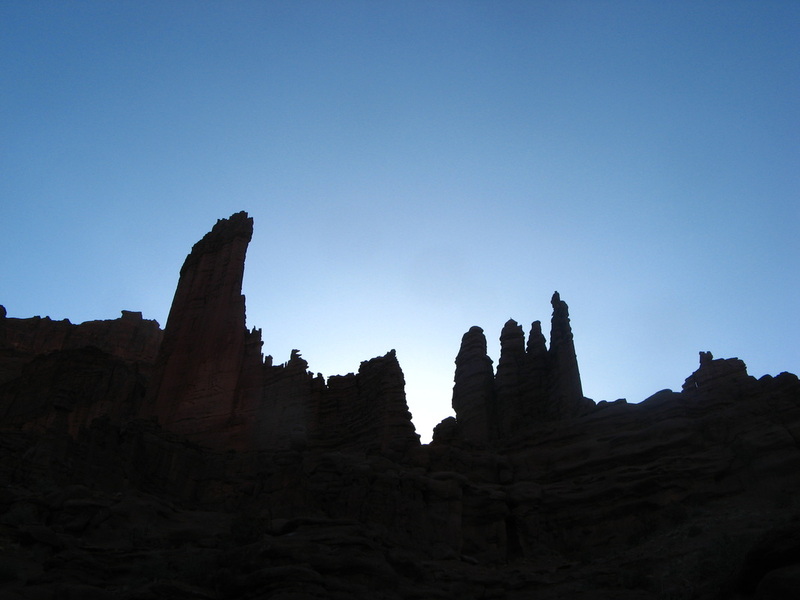 The Fisher Towers invoke many emotions in those who wander there. Their oddly carved walls rear up in an impressive display of rock and mud. 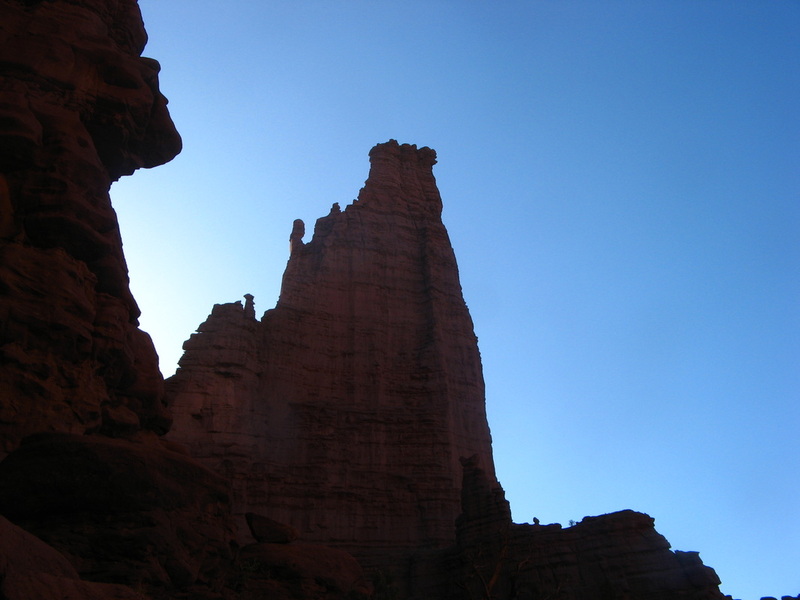 The towers loom over the desert floor and a casual observer would not think reaching the lofty summits even possible. The ruler of this twisted domain is the mighty Titan. 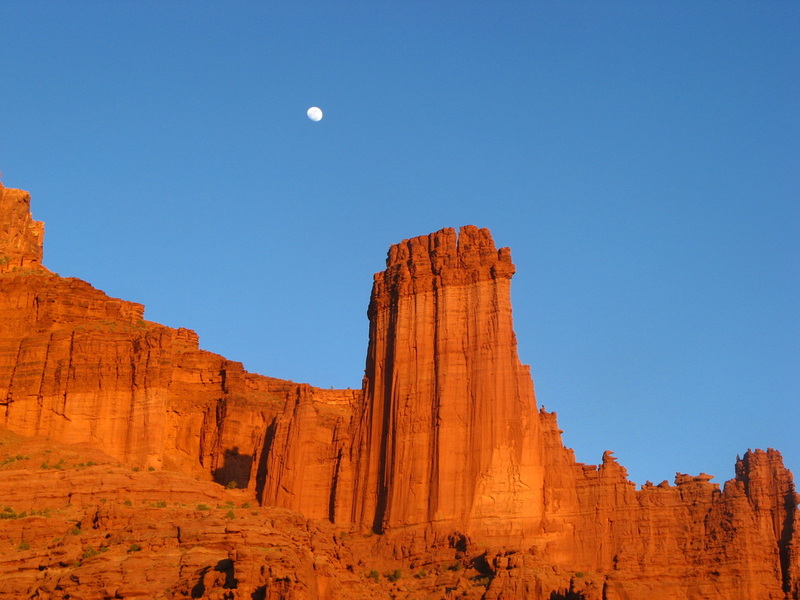 It is the tallest tower in the Fishers and looms close to a thousand feet above the desert floor. 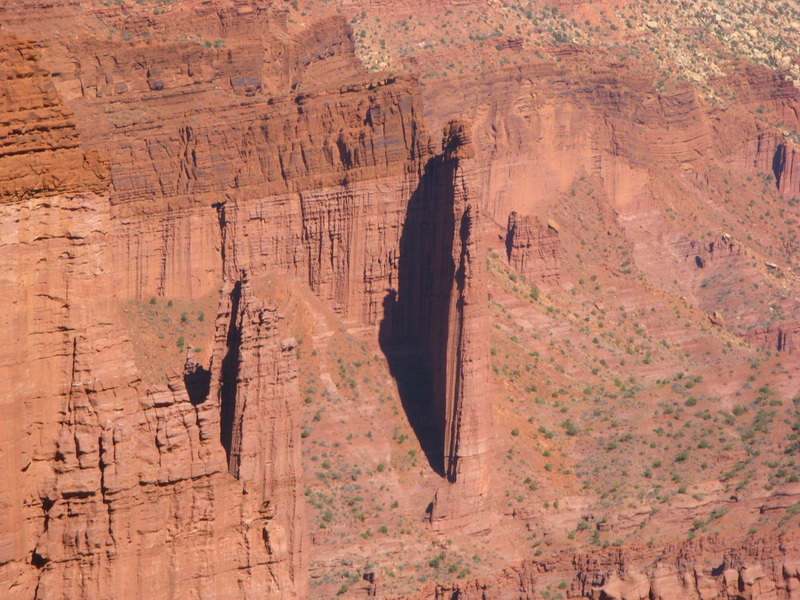 The walls are sheer on all sides and the summit caprock overhangs in a last defense against prospective climbers. 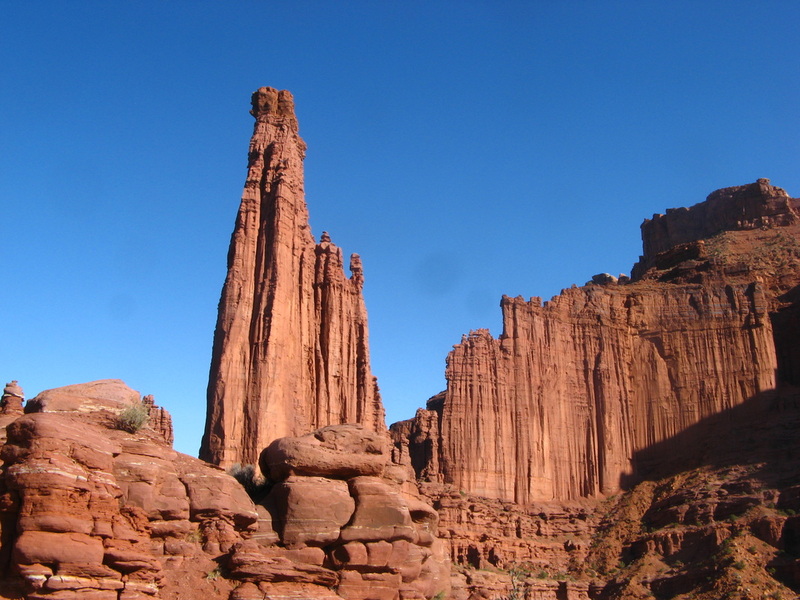 The Titan has been said to be the largest freestanding sandstone pinnacle in North America and possibly the world. As if the tower's sheer walls were not defense enough, the rock is soft and frosted with a layer of mud from top to bottom. 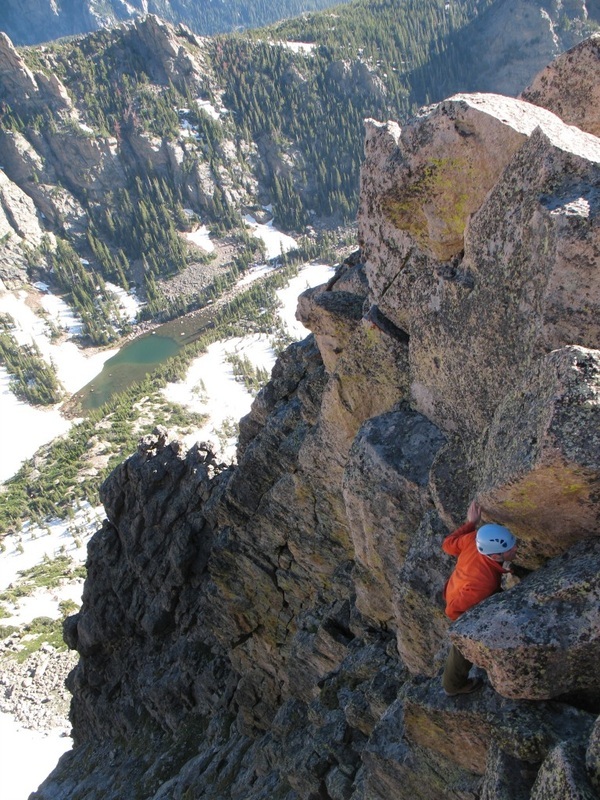 Often climbers accustomed to granite will turn around after a single pitch of this, and return wide-eyed in defeat. Layton Kor, Huntley Ingalls and George Hurley first climbed the Titan in 1962. Ingalls noticed the tower on his survey expeditions and proposed a climb to the National Geographic Society. They were sponsored and Ingalls recruited the unstoppable Kor to take on the project. After many days of climbing over two consecutive weekends (and an uncomfortable bivy high on the route), the three climbers emerged triumphant onto the other-worldy summit with Kor having led every pitch. A pilot hired by National Geo photographed the ascent and Ingalls wrote an article that was featured in the November 1962 magazine (Vol. 122, No. 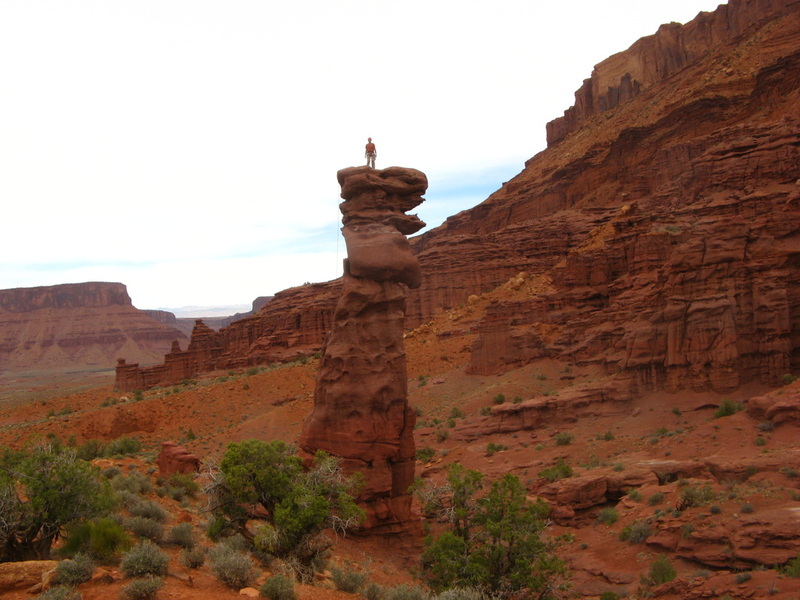 5) titled "We Climbed Utah's Skyscraper Rock". This was the first major tower to be climbed in the Fishers and was a visionary ascent for the time. 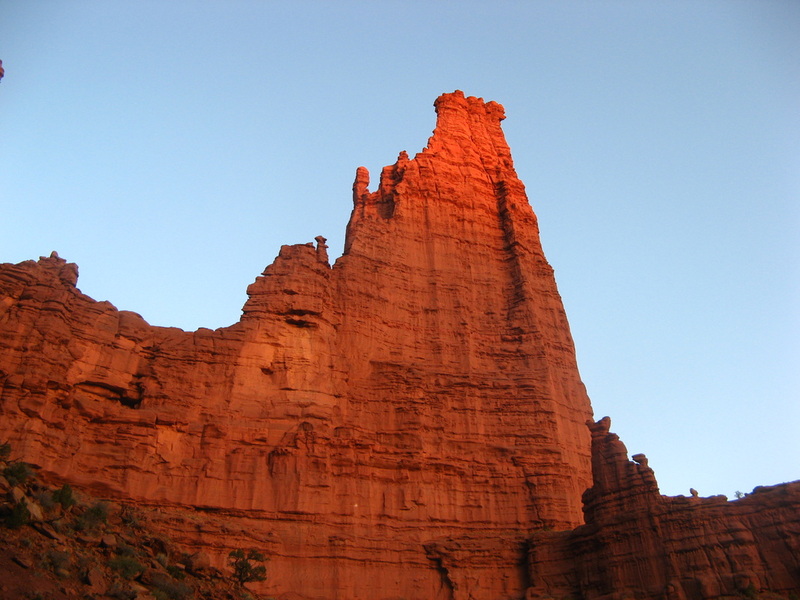 Kor named the route the Finger of Fate after the large pinnacle that is passed on the route. 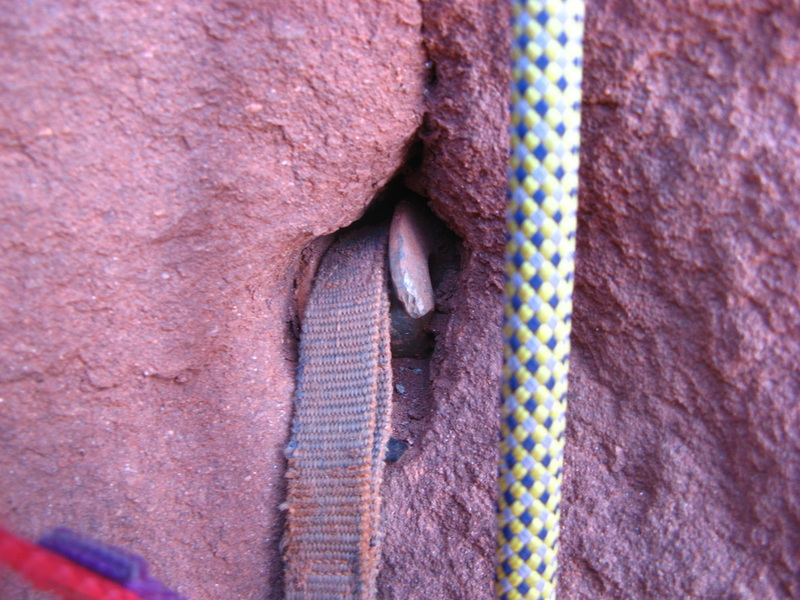 To add to its fame, in 1979 the climb was included in the infamous "50 Classic Climbs in North America" by Steck and Roper. 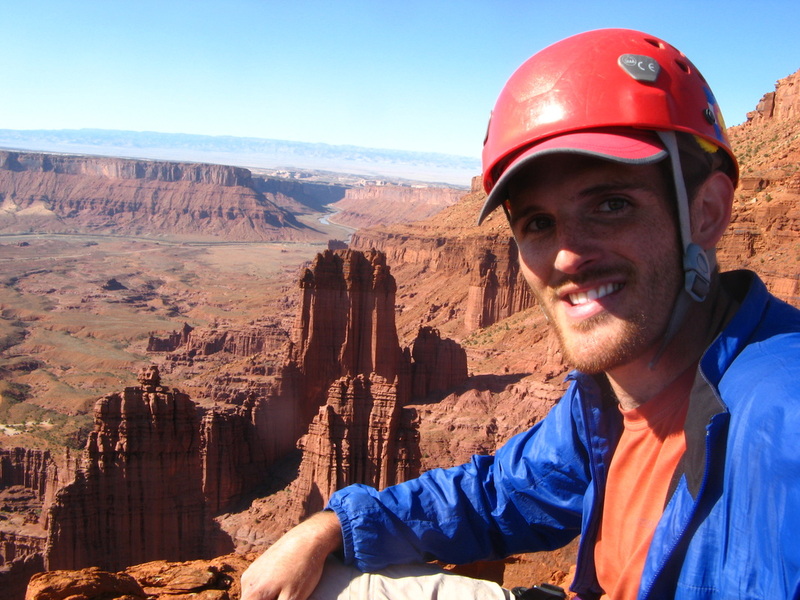 While neither Kor nor Ingalls returned for anything major in the Fishers, Hurley came back for the tower's second ascent. 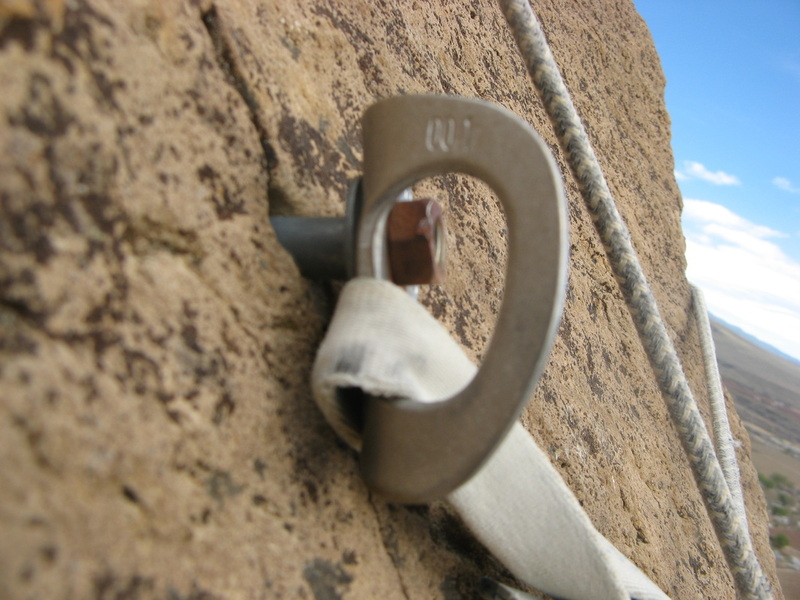 The Finger of Fate is a popular goal for many climbers and naturally found its way onto my list. 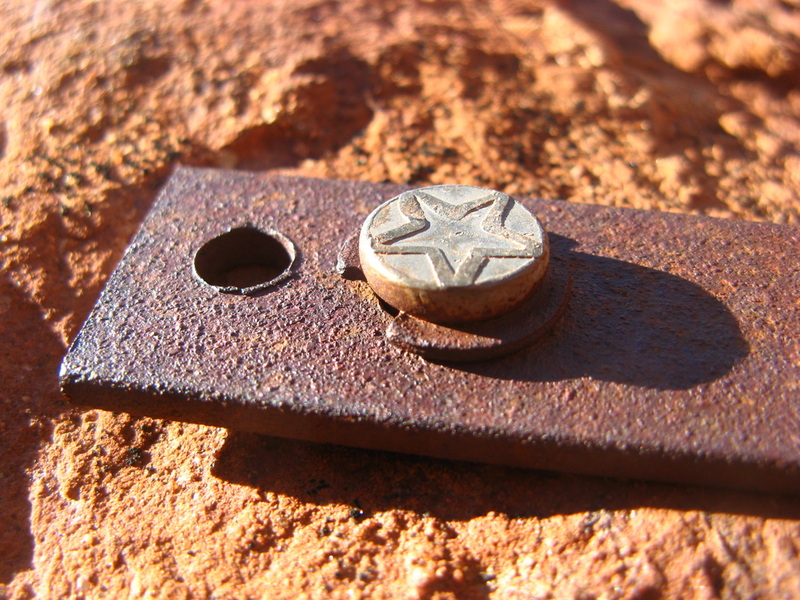 Original bolt near the summit. One star for quality right? Noah on the Sword of Damocles, 3rd ascent. I should have known that packing the morning of was a bad idea. Standing in the living room up to my armpits in a tangled pile of aid equipment was disheartening, and I could almost hear the clock ticking. I had been training and looking forward to this trip for months and I found myself delayed because of my poor packing skills. Finally, everything was in the car and when I pulled in at Noah's late, I shouldn't have been surprised when he starting pulling out as much stuff as I brought. Fortunately, the weather was great and our spirits were high. 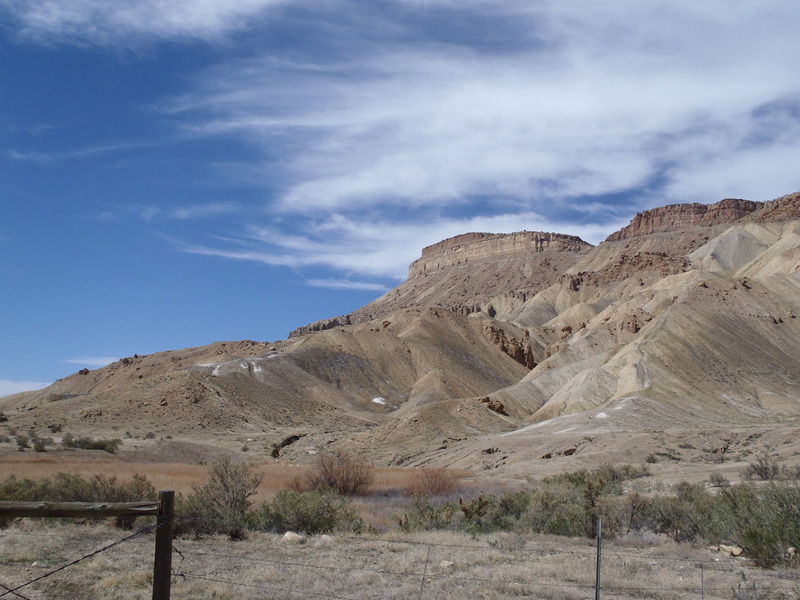 We did nothing but talk about the many desert climbs filling our minds while we happily rolled along I-70. Knowing that we would be spending lots of time on very poor rock, we had selected the first goal of the trip accordingly. 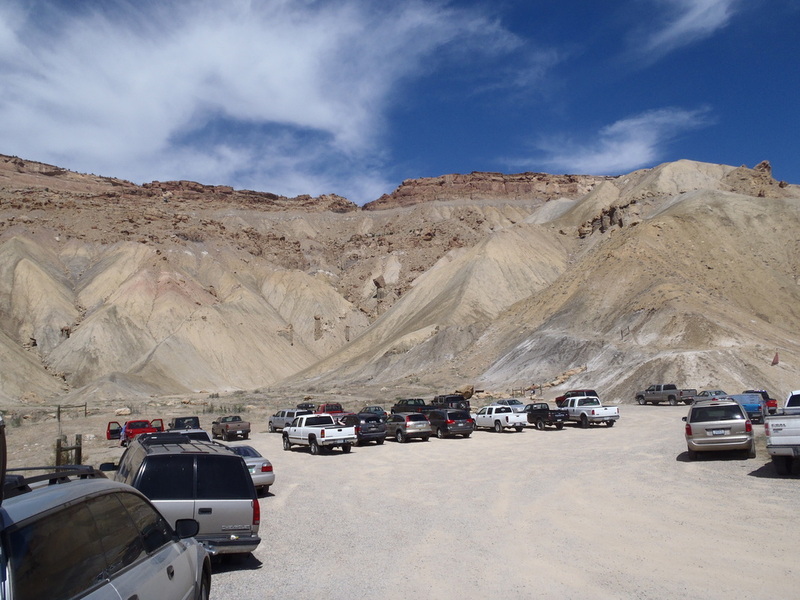 As we exited DeBeque Canyon and rolled into Palisade, we craned our necks upward to see our prize. There, hidden in plain sight on the crumbling slopes of Mount Garfield, sat the Sword of Damocles. The Sword is a sinister looking spindle of mud that rears up and leans slightly as it tapers to a sharp point. 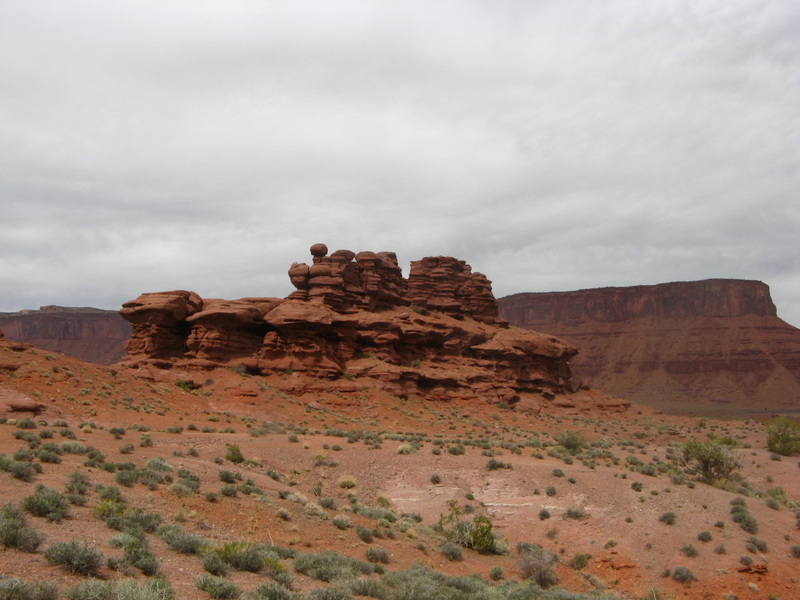 The only rock on the formation is a feeble block that sits precariously on top, threatening to tumble off at any given moment. The base of the tower begins hundreds of feet up an unstable ridge that threatens to dump you off before you ever reach the "rock". 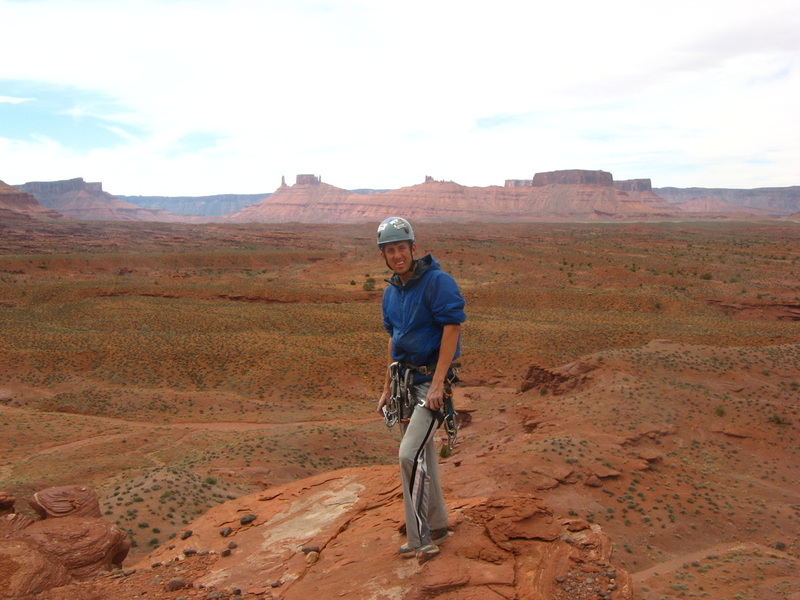 The famous desert rat Paul Ross had done the first ascent only a few years before (2005), and his tactic to handling vertical mud had given me the inspiration to tackle the notorious West Pawnee Butte. Ross bravely pounded 8" hardware store nails into the soft walls of these formations to aid his way upward. 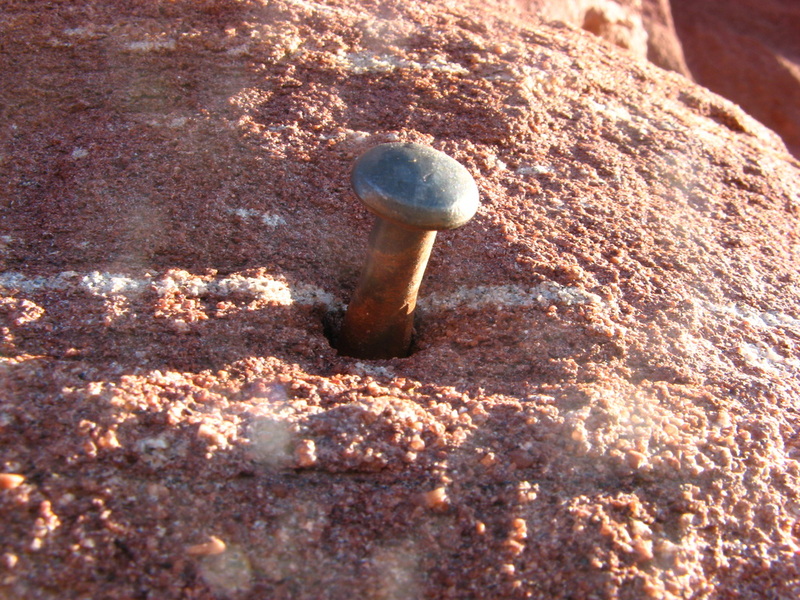 Not many like the idea of these literal nails being your safety line, so many of his routes have yet to be repeated (not to mention that these hoodoos can fall over). We guessed the Sword had only been climbed twice and were excited to make the third ascent. Also, we had assumed that if we started with the worst rock possible, the Titan would seem like granite. This ridiculous notion had us chuckling as we hiked along I-70 and our laughter soon turned to nervous excitement as the spire loomed into sight. Uphill progress was slow but the slope steadily gave way under our shoes. The steepest spot was almost impossible to keep upward momentum and the muddy slope attempted to tumble us back down. The base of the tower finally came and the situation seemed to grow more serious. The rib we stood on was steep enough to make harnessing up nearly impossible, and a slip would send you for a several-hundred-foot tumble. Finally suited up, we tiptoed onto the narrow catwalk that led to the tower. "I don't see any of the nails." I mumbled feebly. "Don't worry, you'll find them as you lead up!" came cheerfully back. "Seriously man. I'm standing 5 feet away and I can't see them." Doubt was creeping up my spine. "That's what we brought nails for! Place some more." "I only have six! This thing is about 80 feet tall..."
As I was about to finish complaining, the first nail caught my eye. It was about 6 feet up the wall and barely showings itself in the mud. As my eye traced upward the nails magically appeared. Not saying any more, I tied in and gingerly stepped up to the first nail. My mind was on full, but as I moved upward I began to relax. Conversation soon flowed again, and Noah was in good spirits considering that he was constantly showered in the falling debris. The climb went smoothly and I only had to place a single nail to replace one that had almost completely eroded out of the neck. The exposure on the top was tremendous considering the tower's small stature, and the single bolt in the summit rock did not inspire confidence. After a celebratory whoop, Noah lowered me off and then led the climb again himself. As we quickly packed up and slid our way down, we knew that we were ready for the Titan. The crowds hiking Mt. Garfield looked at us like we were crazy with our ropes and nails. The only nail I drove next to the old one. The route goes up this face then up the shoulder. Why am I having fun??? Noah looking down on his lead. Noah sliding down the steepest part and hoping the Sword doesn't fall on him. Looking down P2 while trying to avoid eating sand. I woke again from my fitful sleep. A low roar was slowly getting louder as if filled the still desert air. Just as it sounded like a jet was about to fly over, a wall of wind and dirt hit my face. The situation wasn't helped by the large quantities of sand that funneled into my sleeping bag. I rolled toward the car and cinched my bag tighter around my head. "I am the Titan!" growled a voice from behind me. "I talked to the wind and told it to bloooowwwwwwww..."
"Shut up Noah." was about the only reply I could think of. We both laughed and then "slept" the rest of the night. As the sun's first light finally crept into the sky, we ate hastily and carefully sorted through the gear. The wind had stopped its tirade and we hoped it would stay that way. The night before we had talked to a party that had just gotten off the route, and they told us how important it was to have sawed-off pitons to get through the aid crux. Our question of if we'd be fine without was answered by an awkward pause followed by "Do you have tri-cams?" This answer was not entirely inspiring and we laid out the tri-cams early. We had previously decided to fix ropes up to above pitch 4 at the Finger of Fate and then return to climb to the summit the next day. Burdened with excruciatingly heavy loads, we plodded off toward the beast. As the trail slithered its way between the towers, we marveled at some of the other routes that floated up the vertical faces. We talked about how Ancient Art had seemed so big until we started out to climb something close to five times taller. 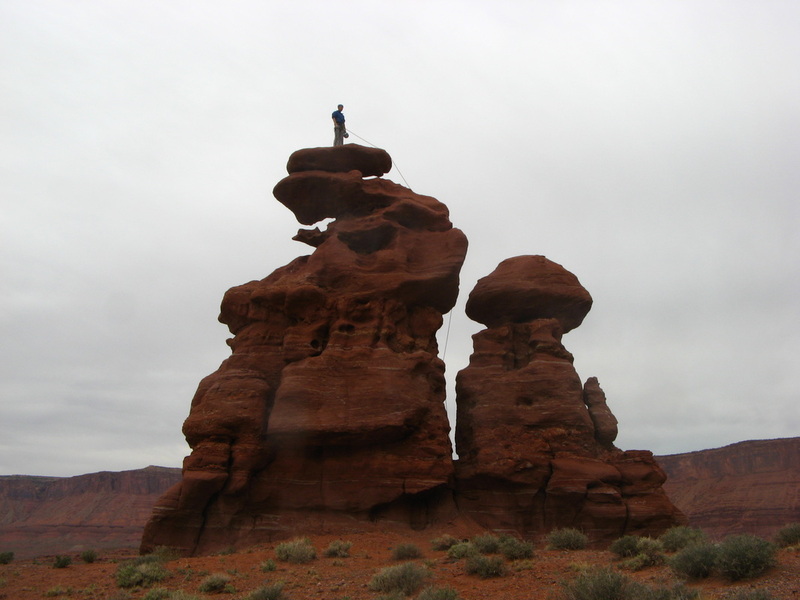 The hike to the base of the Finger of Fate took forever since the trail winds its way 360 degrees around the Titan. The final steep push was terrible with our loaded packs, and when we finally got to the route all we could do was look up. The route was obvious, and the crack system soared upward. It was no surprise why Kor and his chums started here. We quickly geared up and Noah started up the pitch that made many parties decide this was not for them. His initial free-climbing soon gave way to a mixture of aid and french-free. 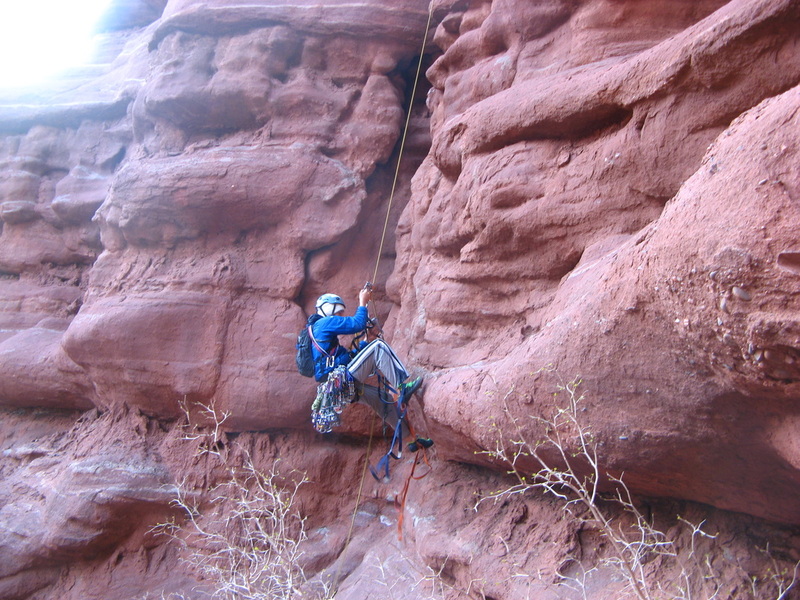 The crack was mostly pleasant and it didn't take him long to reach the belay. I jugged and we soon were passing the mess of gear. Noah informed me that pitch 2 was the aid crux of the route and I planned on linking both the second and third pitch into one. I looked up to see several odd placements followed by a nice looking crack that led up. Crawling over each other and all of our gear was a nightmare, but I was soon standing in my aiders. The pitch went smoothly with only a few bad placements, but it took more small gear than I had expected. The blue TCU proved worth its weight in gold and I back-cleaned the smaller sizes aggressively. 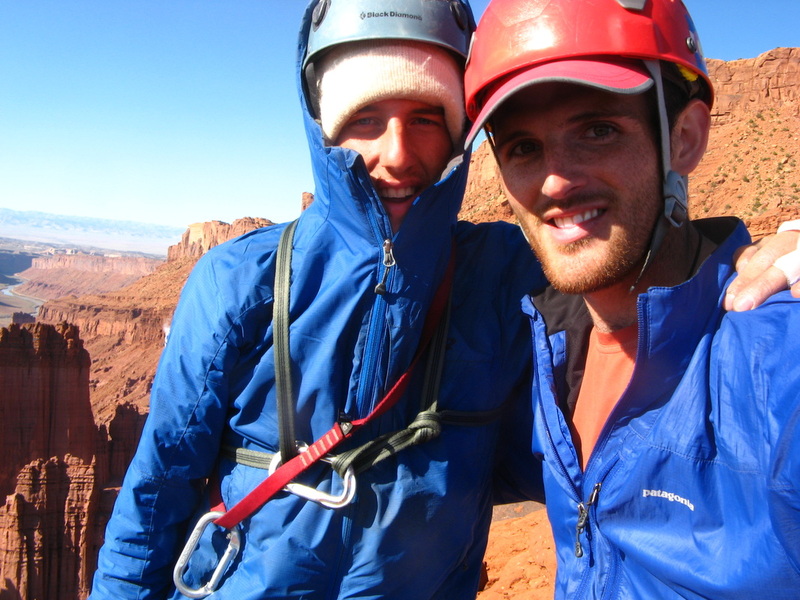 Arriving at the next belay, I decided to have Noah come up and bring the gear so I'd have everything for the next pitch. I was very happy to have what I thought would be the aid crux below me as I started leading again. While Noah ascended the rope, the wind had slowly started to pick up. 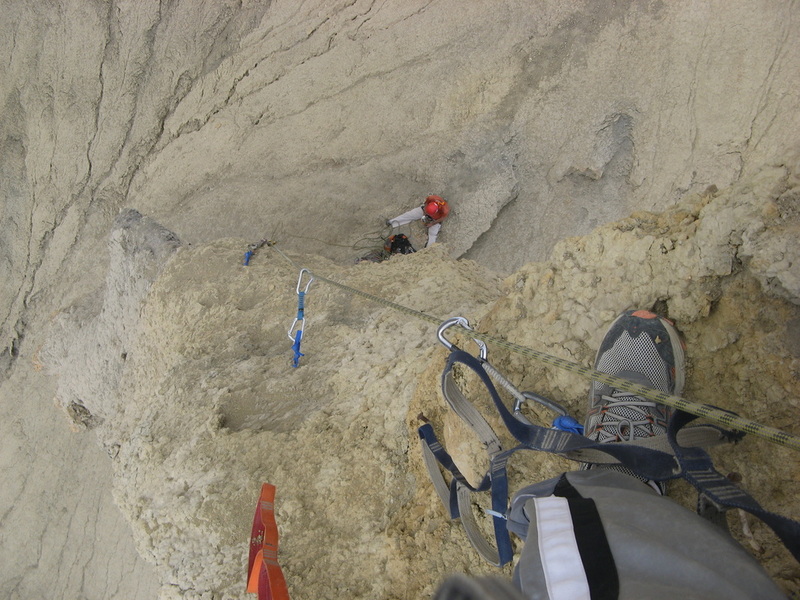 By the time he reached the belay the wind was back to full strength and all the gusts were filled with sand. If the wind was not enough, it soon became obvious that pitch 3 was not going to go quite as planned. 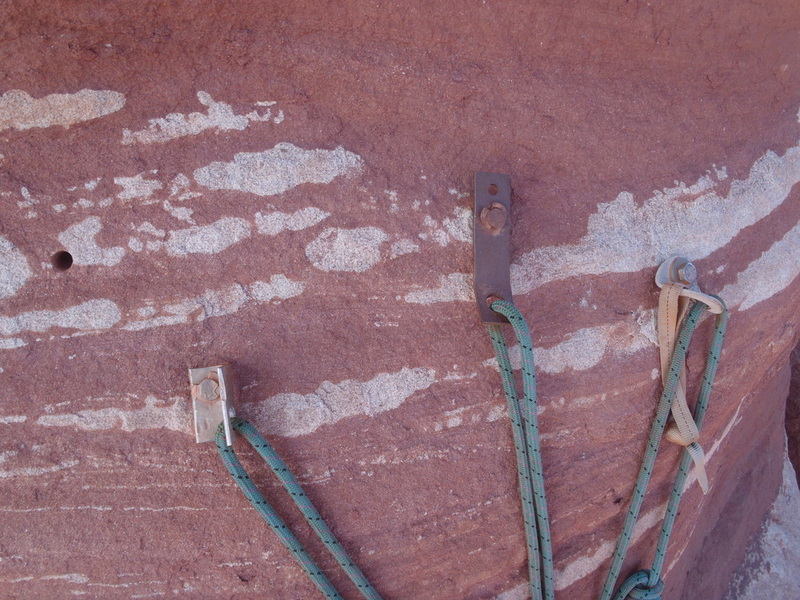 I started off by tenuously making several questionable placements in the old piton scars right off the belay. As the placements became trickier, the quality of rock went downhill. I soon found myself wishing for those sawed-offs, and I fidgeted with tri-cams to make them hold their own weight in the flaring pods. At one point I was faced with a horrible placement in crumbling mud above 5 other body-weight-only placements. Holding my breath, I weighted the piece and quickly top-stepped to get over it while watching it slowly turn out of the rock. I blew a sigh of relief as I clipped in short to the next placement but shuddered as the tri-cam that I had just been standing on fell out. The gusts now funneled into the groove I was aiding up and the gusts blinded me with sand. Having to stop and clench my eyes shut made the pitch drag on forever. "It's like being in a tornado if sand!!!" I called down. The final 20 feet to the belay seemed to take forever, but I finally made a desperate mantel onto the ledge with the anchor. The second and third pitches had taken close to three hours to lead and I was mentally exhausted. 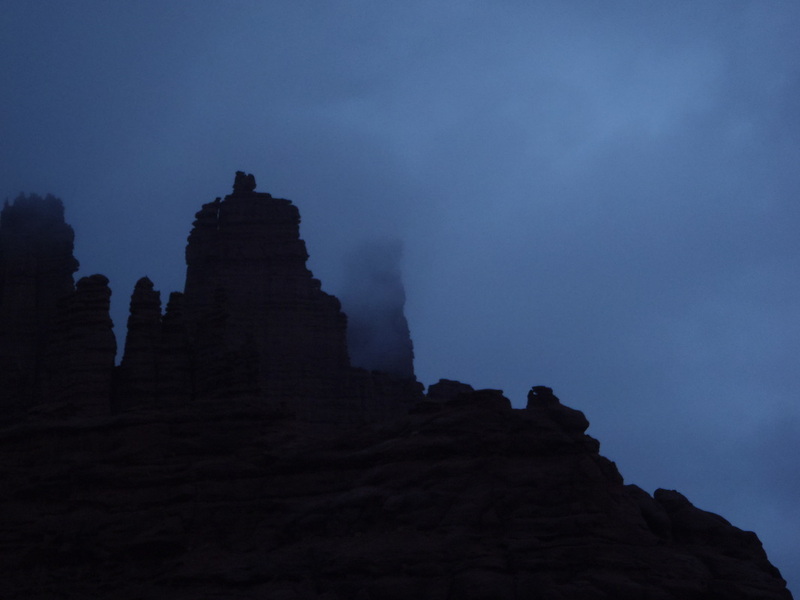 Relieved to be off belay, I called down that the rope was fixed and noticed that the weather was deteriorating quickly. The winds had brought in dark clouds and rain looked imminent. As Noah jugged, all I could do was watch the sky get darker and darker. We both agreed to stop for the day and made a hasty descent. Halfway back to the car I realized I had forgotten the keys with the stashed gear and spent an hour retrieving them. Tired but optimistic with our progress, we soloed up Dock Rock and went to bed early with the excitement that we were going to summit the Titan. Sunrise coming over Kingfisher and the Corkscrew. The Titan. The finger of fate is seen on the left skyline. Circling the tower. Sundevil Chimney clearly seen. Brave climbers finishing the rarely repeated World's End (5.9X A5). Almost there. The approach was also a bit interesting. The route in site! It follows the obvious cracks straight to the finger. The madness sets in as Noah readies to lead the first pitch. Looking up the start of the route. The first 3 pitches can be seen. Not sure what's holding that in there and sadly this was a good placement compared to many. Still having fun! This was before the rock turned bad. Cottontail, Echo and Kingfisher taking on a sinister appearance as the storm rolls in at the top of P3. "It snowed." I said flatly. "No it didn't." came mumbling back. Knowing that a slight chance of rain was in the forecast, I figured that there would be some precipitation. What I didn't expect was peeling open the tent to see snow. I crawled out into the mist and was greeted by a nice mixture of snow and rain floating gently from the sky. Castleton was frosted down to the base of its summit cone and snow looked like it came down to the base of Kingfisher. The Titan brooded behind the clouds and only greeted us with its pressence long enough to tease. Knowing that climbing was out for the day, we took it easy and waited for the skies to clear. 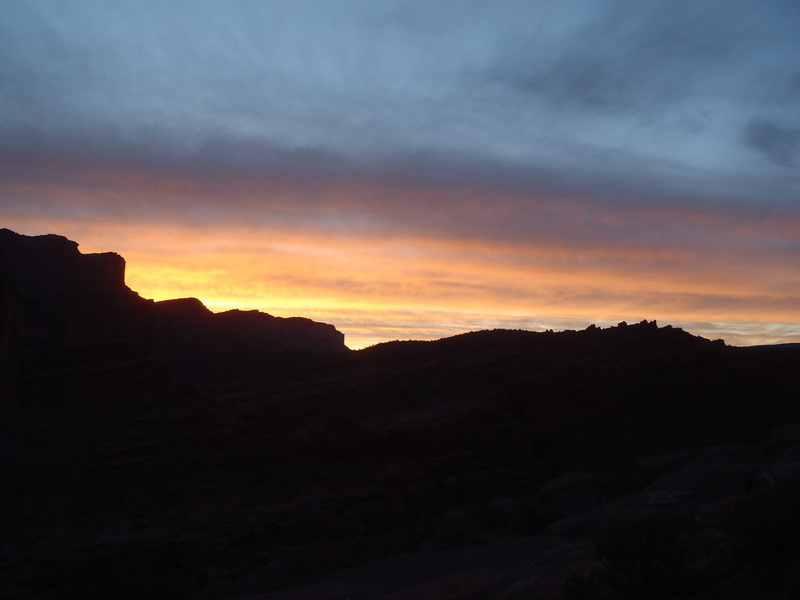 After a few hours it became apparent that it wasn't going to stop and we loaded up and rolled into Moab. Finally able to check the forecast, we found that the worst of it was past and that the sun was supposed to come out of hiding shortly. We loafed about town and enjoyed having some time out of the dirt. The streets were lined with jeeps for the Easter jeep safari and we laughed at the quantities of jeepers eating each other's fumes. 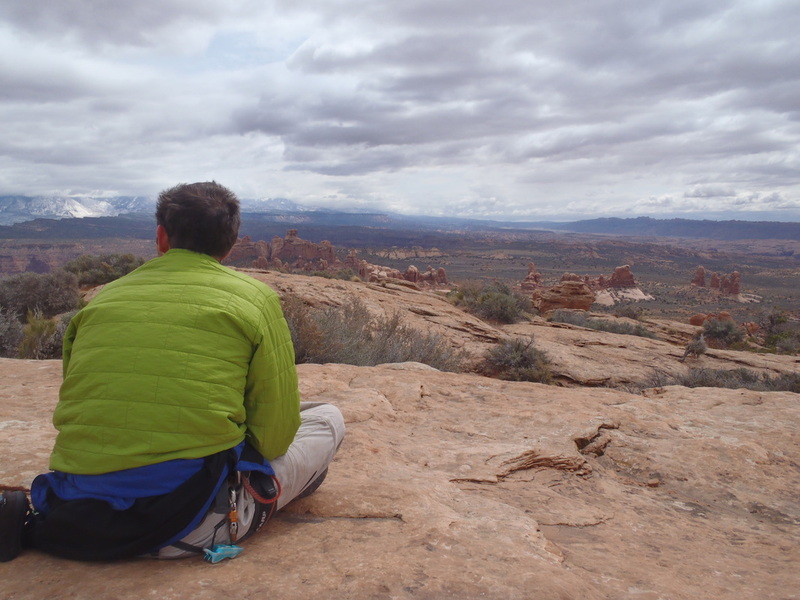 Arches proved a nice place to wash dishes and we made a quick loop of Elephant Butte. The soggy slabs proved more exciting than expected, but the summit gave excellent views of the gloomy weather. The rest of the day was spent waiting for the clouds to clear and the longer it took the more obvious it became that we'd be waiting out the following day as well. Tuesday proved much better, and as we loafed about the rock quickly dried. As the Titan called, we felt optimistic and went to bed early once again. The Titan brooding in the clouds. En route to Elephant Butte. 6th time on Elephant Butte. When are these clouds going away? 3rd or 4th time on Dock Rock. We finally have some sun! The morning came quickly and sleep was off and on at best. The thoughts of what lay ahead floated through my brain throughout the night. Most of the rock had seemed to dry, but wet spots still permeated the ground in the shaded aspects and I worried the Titan would still be in a weakened state. 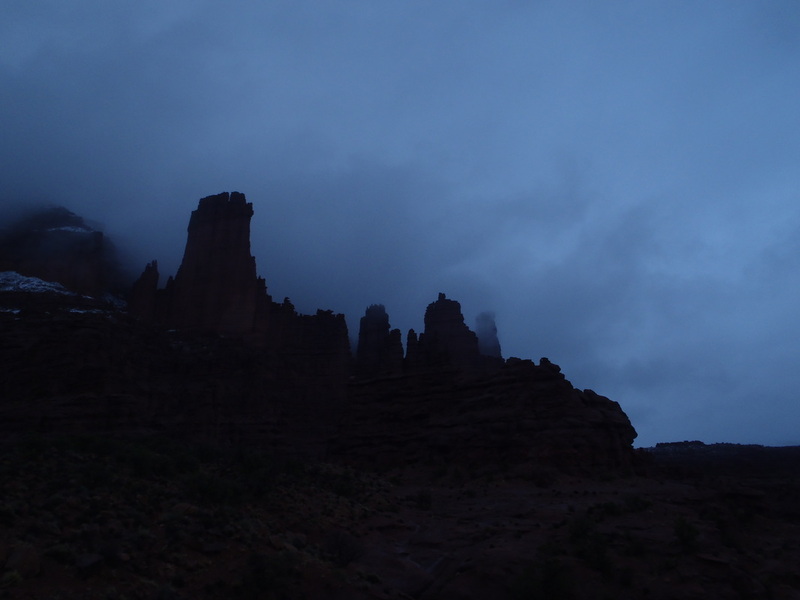 We quickly ate breakfast and sped out into the inky black just before dawn. The trail was much trickier to follow in the dark but we knew it and were soon watching alpenglow sneaking up Sundevil. It didn't take long to reach our stashed gear and jugging the rope proved to be fairly painless. 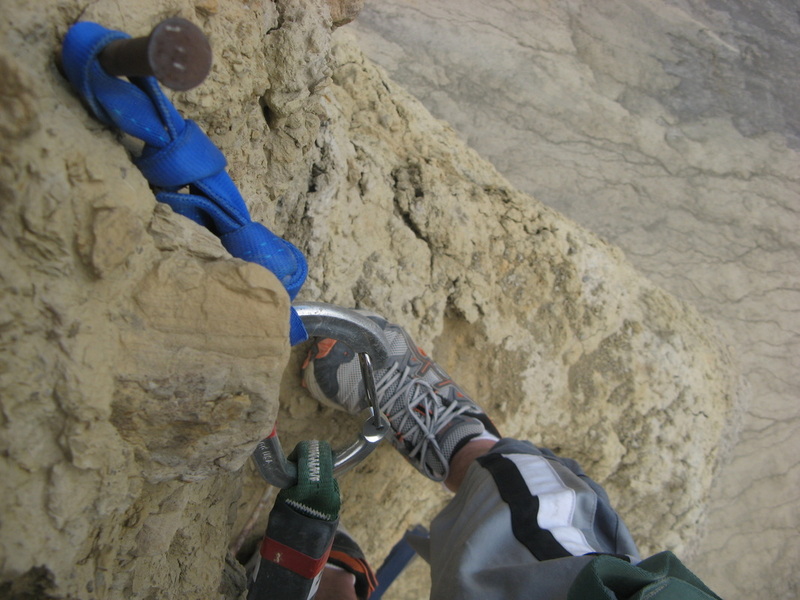 Cramped on the tiny ledge 300 feet off the desert floor, we cautiously passed gear. The fourth pitch was notorious for a spooky 5.6 traverse followed by overhanging aiding on very poor fixed gear, and we had been slightly anxious about it. Noah gingerly tiptoed around the corner and was immediately out of my sight. I occasionally fed out the rope as I took in the scenery. Tracing my eye up and down the Oracle while searching for the route was inspirational. The walls looked impossible and the notorious 5.9X pitch looked horrifying. As I imagined Harvey Carter and his partners climbing bravely into the unknown, I was whipped back to reality as the rope snapped tight. I called out to Noah and gave a sigh of relief to hear that he was ok. 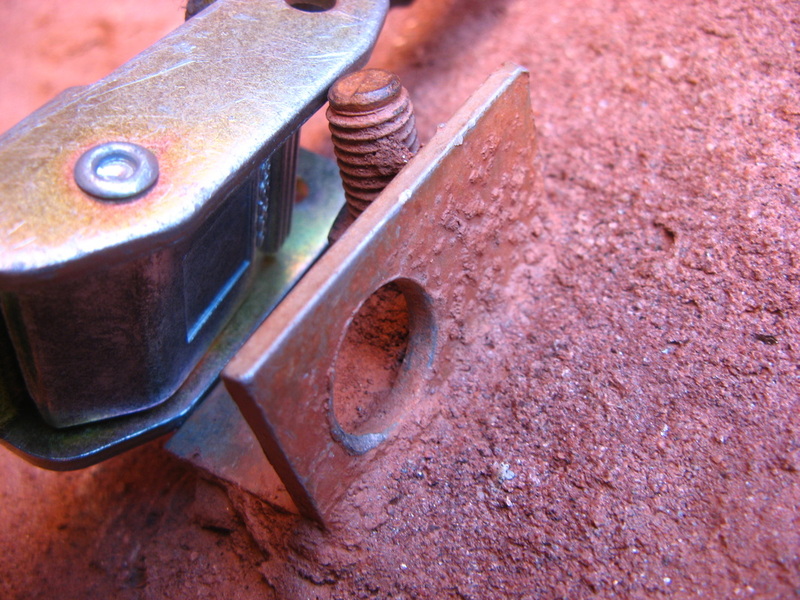 He had placed a large cam into a blown-out piton scar to have it pop out in his face. His fall was onto the top fixed tri-cam, and we were both stunned that the crusty old piece held. After a short minute, he was immediately back at. The rest of the pitch passed quickly as Noah thrashed up the awkward offwidth to the belay at the base of the Finger of Fate. I carefully lowered out over the void and silently cheered that I hadn't had to lead it. The fixed gear was scarcely holding its own weight and the aiding would was awkward at best. Also, the free moves at the top would have scared me knowing what type of pro laid below my feet. The base of the Finger was said by Kor to be the turning point of the climb and we congratulated ourselves for making it there. 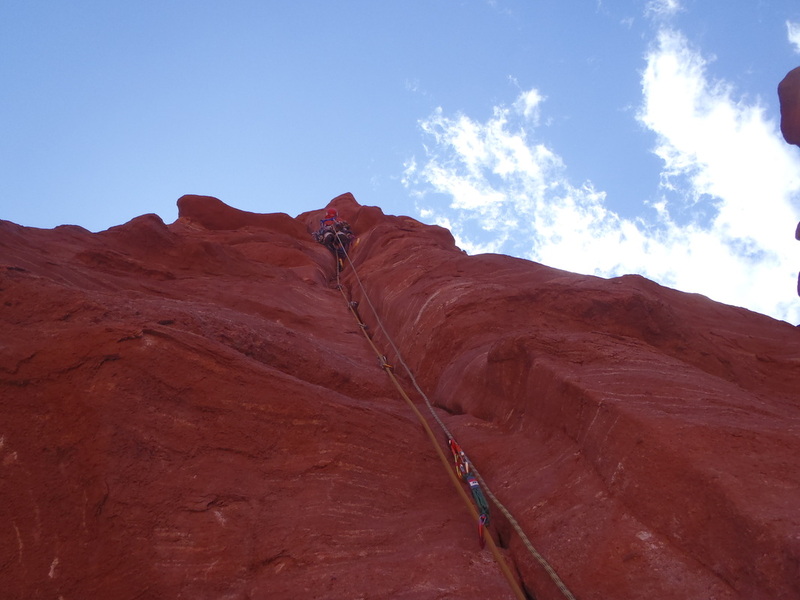 I lead up into the intimidating flaring chimney/offwidth but was able to get through it relatively smoothly. The final 10 feet required free climbing up a squeeze chimney and I was forced to clip my extra gear to the top piece so I would fit. I fixed the rope and called down "I can see over the Finger!!!" Although mentally exhausted, I was optimistic that we'd make it to the top. The "3rd class" around the duck proved to be exposed 5.0 and the 6th pitch proved to be easy, fun and short. The short chimney was readily free climbed and we both decided to take a break on the comfortable bivy ledge. Air was starting to creep up all around us, and we knew it would crescendo as we forged upward. Noah took lead again and quickly dispatched the scary traverse right into the thin seam. Delicate aiding interspersed with sandy free moves lead up to a spectacular hanging belay on the summit arete. 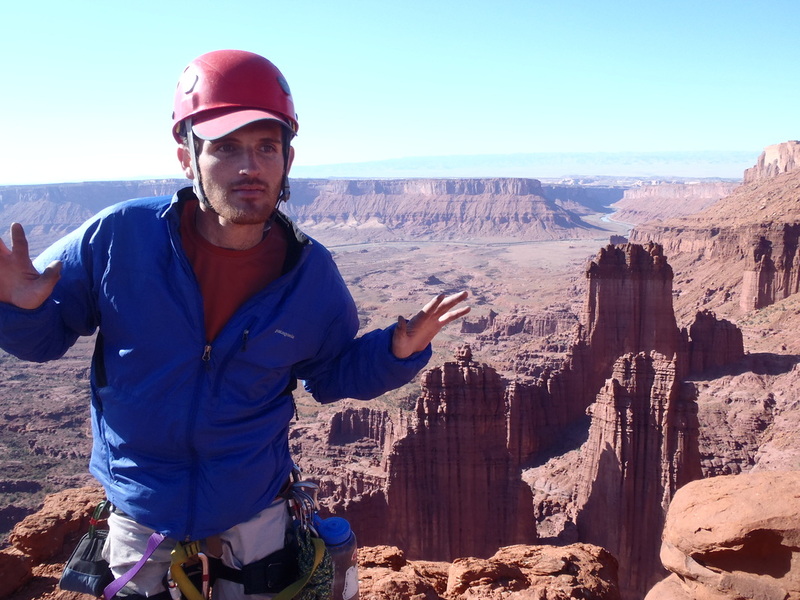 I tried to mentally prepare myself as I jugged, and arrived at the belay amped for the final pitch. I felt the vast quantities of air tugging gently on my shoes as I began upward. 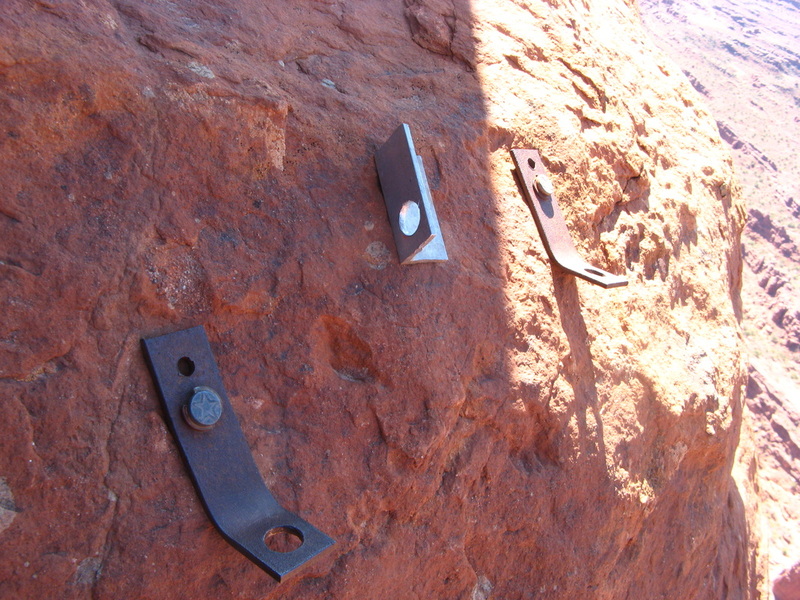 The large spaces in the bolts forced me to lasso and stick clip a few placements and I was glad to reach the capstone. Aiding the final overhang was solid enough and my senses heightened as I began to delicately traverse out over the void. The final 5.8 free moves to the summit plateau proved frightening due to my heinous ropedrag, and I was forced to leave all of the gear clipped to the last piece. It felt like a thousand pounds were hanging from my harness, and I was barely able to pull enough slack to fix the rope for Noah. I folded over the nearest rock and ate jellybeans as Noah jugged. It was almost unfathomable to comprehend were I was after close to 13 hours of climbing between the two days. After Noah arrived, we belayed a mini-pitch to just below the summit and were not surprised that the "4th class" ended up being extraordinarily exposed low 5th. We untied, counted to three and stepped simultaneously onto the summit. The feeling was electric and the small plateau felt like being on a saucer suspended in the sky. A family casually hiking the trail below appeared no bigger than ants and it was hard to imagine that they were close to thousand feet below us. 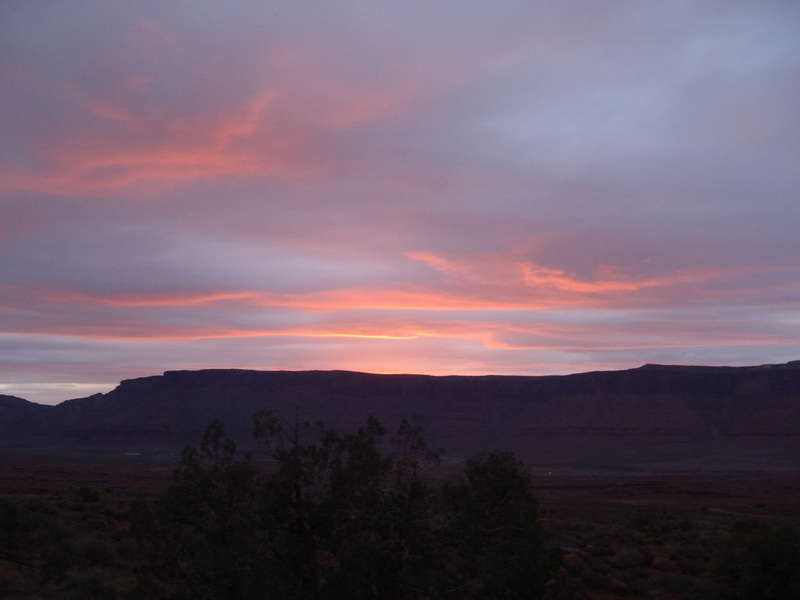 The La Sals were still coated in fresh snow from the recent storm, and the Colorado River lazed by. Miniature cars casually rolled along I-70 in the distance and the maze of canyons and towers below our feet was boggling. We relaxed and took in the amazing vista for close to an hour before reluctantly deciding that it was time to go. It was a hard place to leave, but we knew that a descent in the dark would put a major dent in our day. 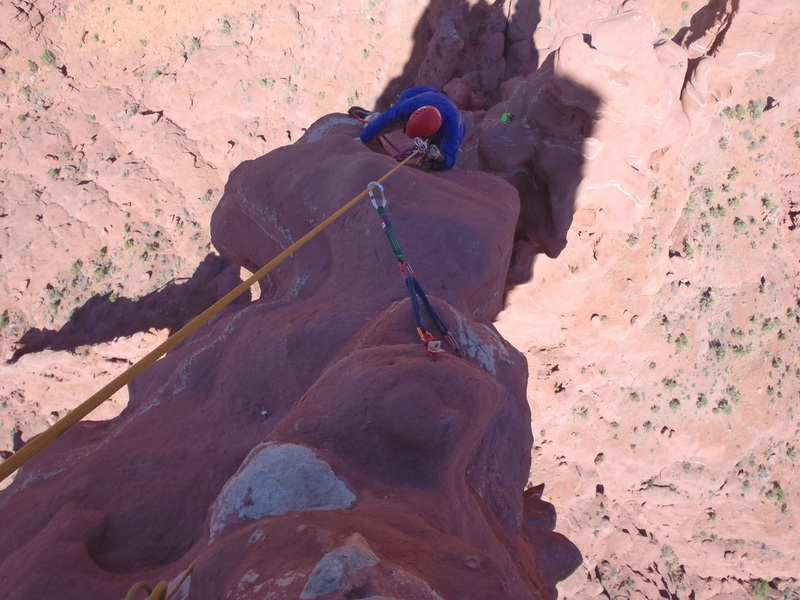 The rappels all went smoothly but the extreme care we put into them made it go slowly. Touching back onto the Earth was a tremendous feeling and it already felt that the Titan had been a dream. The evening light turned the skies to fire and we loaded or burdens onto our backs. As we painfully made for the car, the sun kissed the Titan goodnight right as we were about to lose it from view. As I watched the crimson glow on the improbable beast, I could almost feel it calling out to us into the still air. 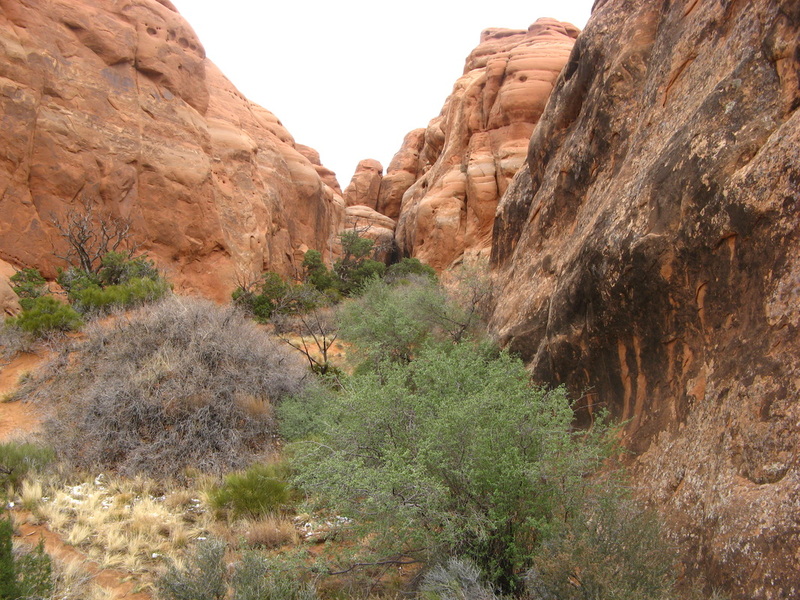 Looking toward the P4 traverse. If this doesn't inspire confidence I'm not sure what does. Bomber! This caught the only fall on the route. Me leading the P5 offwidth. Looking down P6 with me sitting at the duck. 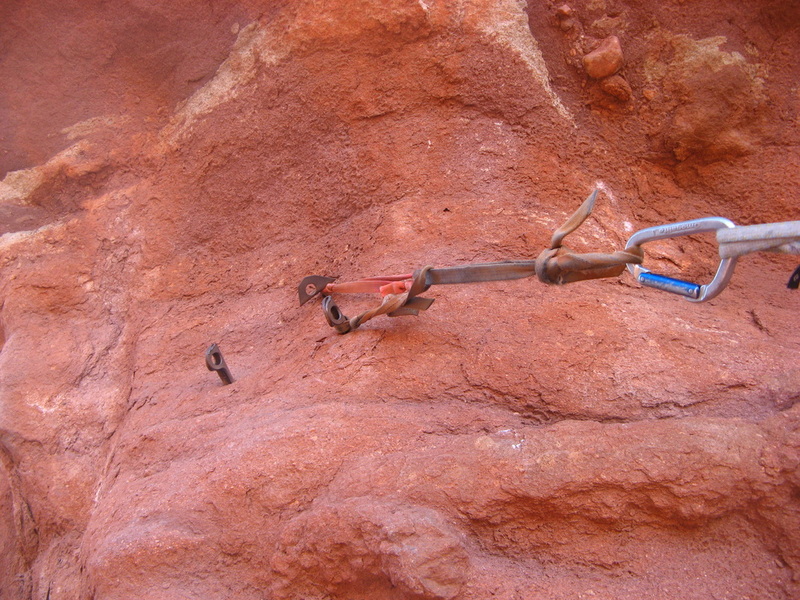 Orginal anchor on the bivy ledge. 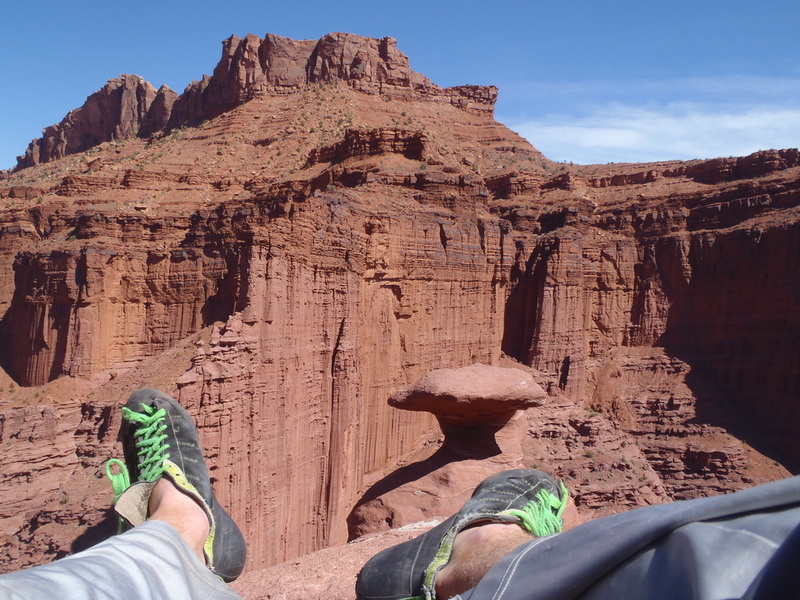 Mental break on the bivy ledge. Me coming up to the top of P7. Note the "awesome" bolt. Me leading the final pitch. You'd be weird too if you climb this thing. Muddy piece in the rappel gully. Who, having once enjoyed it, does not long for the deep satisfaction of beholding a panorama from a vantage-point, access to which has cost something in effort and training; of knowing that here is a frontier still; of being aloof, and yet in close communion; of being awed by the great, but remaining proud of the success of the organized efforts of the small? 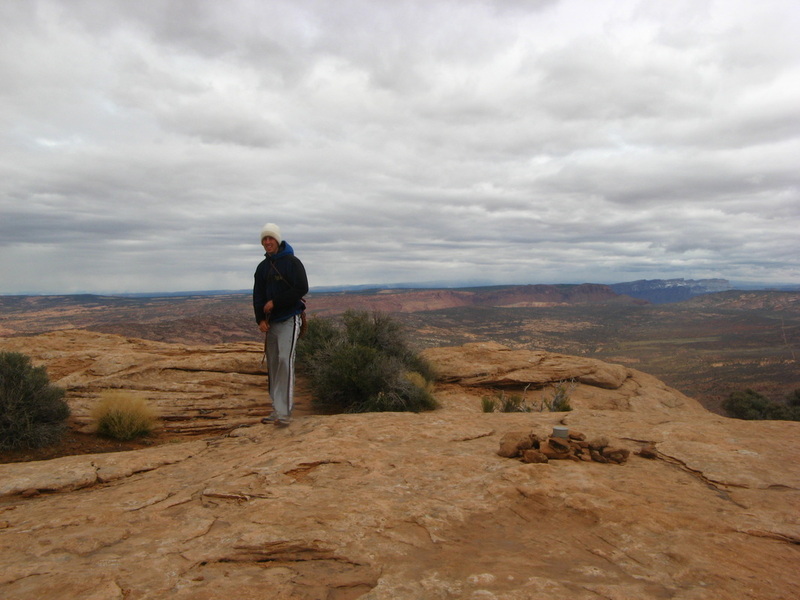 Noah on the unnamed butte.